Research consistently shows the power of vocabulary in determining academic destiny. Students with weak vocabularies tend to decline academically, while students with stronger vocabularies tend to learn faster. 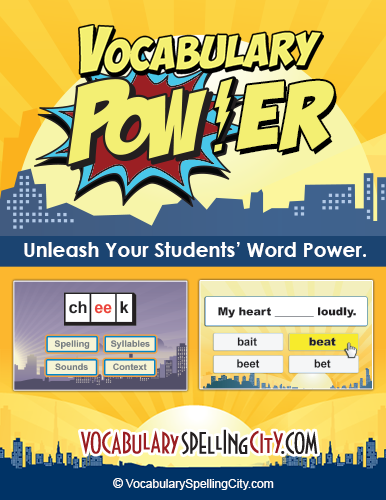 With effective direct vocabulary instruction and fun word games as practice, vocabulary becomes your students’ superpower – not their kryptonite. Students need between 12 and 15 exposures to a new word in order for it to move into long-term memory. How can teachers accommodate repeated review with the challenges of a classroom schedule? This is where VocabularySpellingCity comes to the rescue! After you explicitly teach the vocabulary words, students use our site to hear, say, read, write, and play with their words through engaging learning activities. Educational researchers Robert Marzano and Dr. Joe Lockavitch say learning vocabulary is critical to reading comprehension, writing, and other literacy and communication skills. Students should generate their own explanation or description of a word. Using Sentence Writing Practice, each student can be asked to either write a sentence using the word or to write descriptions. Exposure to oral language improves vocabulary growth. Most exercises and games include both saying the word by itself and within a context-rich sentence. Repetition improves vocabulary acquisition. The 35+ activities and games provide repetitive encounters with a word without being tedious. Playing word games reinforces learning and memorization. A wide variety of audio and visual games and activities, with animation and graphics, are a fun way to motivate and challenge students. Lockavitch and other educational researchers say that providing multiple engagements with new words over an extended period is necessary to commit them to long-term memory. Word exposures should be done in ways that engage different senses: The student should read the word, write the word, hear the word, and say the word. VocabularySpellingCity Premium Membership offers a variety of vocabulary activities. Try a few of these examples. Play WhichWord? Sentences with a Synonyms list. Play MatchIt Sentences with the Prefix “anti-“ word list. Word-O-Rama follows a game show format to encourage students to identify words by their definitions, synonyms, antonyms, or by context within a sentence. TeachMe More gives students the opportunity to explore spelling, syllables, sounds, and context, including definitions and parts of speech. Try TeachMe More with a 2nd grade math list. Try Vocabulary TestMe with a word list for Multiple Meanings. Play Sentence Writing Practice with a 3rd grade Homophones list. Play Paragraph Writing Practice with a 8th grade Compound Words list.